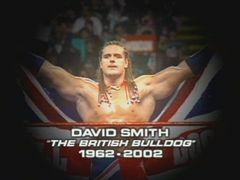 The WWF pays tribute to the British Bulldog who passes away 2 days ago..
KICKOFF: Rob Van Dam + Undertaker. 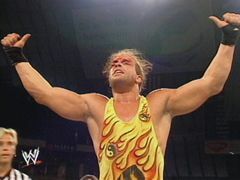 RVD comes to the ring for a match.. The Undertaker sneaks up behind RVD on the ramp and attacks him..
Undertaker assults RVD, busting him open on the ring steps..
Undertaker gets on the microphone..
Undertaker says that as champion, he should be the one to open RAW..
Undertaker says that there are going to be some changes..
Undertaker says he will do whatever he wants..
RVD tries to crawl back into the ring but Taker kicks him down again..
Taker talks about killing Hulkamania at Judgement Day..
Taker demands to be respected..
RVD struggles back into the ring and wobbles around..
Taker goes to attack RVD again..
RVD fights back at the Undertaker like a wildman.. The referee's pull RVD off..
RVD breaks loose and runs back to the ring..
RVD kicks Undertaker in the head from the second rope! RVD hits the frog-splash on Undertaker!! The referee's again pull RVD off..
Undertaker escapes the ring and retreats..
A bloody RVD coaxes Taker from the ring.. FLAIR'S OFFICE: Ric Flair/Arn Anderson & Undertaker. Undertaker barges into Flair's office and demands a match with RVD.. Flair agrees and makes it an Undisputed Championship..
Undertaker says he only wants a match.. Flair says it will be for the title..
Undertaker agrees but says "Damn!" Flair turns to Anderson and tells him that he's gonna tell Austin how it is! MATCH: The Hardy Boyz vs The Big Show & XPac w/Booker T..
Late in the match, Booker T tries to interfer but messes up! Goldust, dressed at Elvis, steps into the ring..
"Elvis" distracts XPac long enough for Jeff Hardy to roll XPac up for the win! XPac & Big Show get mad at Booker T after the match.. BACKSTAGE: Trish Stratus + Paul Heyman..
Heyman approaches Trish and asks her to get together later tonight..
Trish says that she's got a match, and leaves the area..
Heyman celebrates that it wasn't a "no".. BACKSTAGE: The nWo & Goldust. Big Show & XPac yell at Booker for his 'friend' costing them the match..
Booker says that Goldust is NOT his friend! Big Show says he's sick of this and proclaims himself the leader of the nWo! XPac says he's been in the group longer than both of them so he should be leader..
Goldust says that if they let him into the nWo HE might be leader! Booker T says that he is going to be the leader and he's going to proove it! WOMENS TITLE MATCH: Trish Stratus vs Jacqueline. Trish defeats Jacky after a hard fought match..
Trish and Jacky shake hands afterwards.. Suddenly Paul Heyman and Brock Lesnar crash the party..
Paul Heyman demands that Trish answer his proposition..
Paul threatens Trish if she doesn't say yes..
Trish yells "NO!" at Heyman..
Brock gets into the ring and bullies Trish into the corner..
Bubba Dudley runs down and gets in Brock's face!!! Heyman holds Lesnar back however.. FEATURE: A Day in the Life of Tommy Dreamer II. Dreamer goes to get a haircut..
Dreamer eats his own hair. Dreamer eats some kind of hair gel..
Dreamer eats some more hair, from the floor this time! BACKSTAGE: Rob Van Dam + WWE Trainer.. The Training suggest RVD not go back out there..
RVD refuses and says he will fight the Undertaker tonight! EUROPEAN TITLE MATCH: William Regal w/Molly vs Bubba Ray Dudley. Molly grabs Bubba's leg during the match..
Bubba yells "Bubba! Get the table!!" As Bubba goes out to get a table, Brock Lesnar attacks from behind!! Lesnar his his brutal finisher on Bubba! Lesnar & Heyman leaves the ring..
Regal knocks Bubba out with brass knuckles to the back of the head! IN THE RING: Ric Flair & Arn Anderson. Flair says he wasn't the legal man when Austin pinned him last night! Flair says that he corrected the record book.. Flair calls out Steve Austin..
Arn Anderson reminds Austin that Flair has 'permanent backup', that being Arn.. 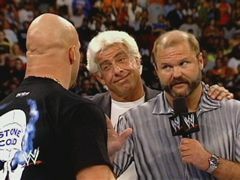 Flair says that he made some of the same mistakes as Vince did.. Flair says he's going to try Plan-B.. Flair says that Austin is property of RAW -- Flair's property.. Flair says he's taking Austin "Out" of matches in the ring.. Flair says that as of tonight, Austin is BENCHED! Flair says Austin has the night off, and to get out of his sight! Austin stuns Arn Anderson and then Ric Flair!! Austin celebrates with a couple beer in the center of the ring..
RINGSIDE: JR, King & Raven..
Raven joins JR & King at the announce table..
Raven bullies King about not knowing anything about Wrestling..
Raven says if King knew women, his WIFE wouldn't have left him! MATCH: The Hardy Boyz vs Booker T & Goldust..
A few minutes into the match, the nWo comes to ringside..
XPac nails Goldust allowing the Hardyz to get the win!! Booker T seems to stick up for Goldust after the match..
LOCAL PUB: Stone Cold Steve Austin & Debra..
Steve & Debra walk in and sit at the bar and order beers..
Editor's Note: Kootos to the WWE camerman who guessed where the Austin's would go. IN THE RING: The nWo, Booker T & Goldust..
Booker T tells XPac that he thought they were on the same time..
Booker, XPac & Big Show bicker back and forth..
Big Show says he has no problem taking Booker out, personally..
nWo music hits and Kevin Nash comes to the ring..
Nash eyes Goldust, who slides backwards out of the ring..
Nash says that Flair put the nWo shirt on Booker T..
Nash says Flair runs RAW and NASH runs the nWo..
Nash says that Big Show has digraced the shirt recently..
Nash, Big Show & XPac unite as the new World order..
Nash looks at Booker T..
Nash says that the nWo always has room for a 5-time World Champion.. Finally the nWo is united in harmony..
LOCAL PUB: Steve Austin/Debra + Eddie Guerrero.. The waitress gives Debra a drink and teddy bear from the man 'over there'..
Steve Austin looks to see Eddie Guerrero raising his beer to the Austin's..
Steve questions Debra why Eddie is sending her drinks and teddy bears?!?! RINGSIDE: Jim Ross, Jerry Lawler & Raven..
Raven continues to insult the King about lack of wrestling knowledge..
Raven gets up into the ring and challenges the King to a match.. The hometown boy stands up on the announce table and accepts the challenge..
LOCAL PUB: Steve Austin & Debra..
Debra convinces Steve Austin to sing a song for Debra..
Eddy jumps up on stage and tells Austin that he's 'got this one'..
Austin stares Guerrero down but Debra holds Austin back..
Eddy begins to sing a song.. very poorly.. 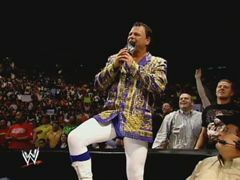 MATCH: Raven vs Jerry "the King" Lawler..
Late in the match, Raven runs away from the King.. The referee counts out Raven..
Jerry Lawler wins the match by Count Out! Austin changes songs and sings The Chair by George Straight..
Eddie Guerrero is shown NOT enjoying the show..
Austin gets in Eddie 's face, but Eddie doesn't even look up..
Austin says he's gonna sing another song, and turns his back..
Guerrero runs up behind Austin and breaks a beer bottle over his head!! UNDISPUTED TITLE MATCH: Undertaker vs Rob Van Dam..
RVD starts the match by leaping over the top rope onto Taker..
Late in the match.. RVD covers Undertaker with Taker's foot on the rope.. But the ref counts ONE... TWO.... THREE!!!! 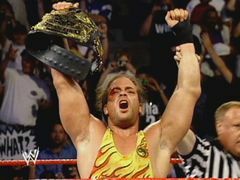 RVD is awarded the Undisputed Title and history is made!!!!! Ric Flair comes to the ring and restarts the match..
Undertaker quickly sets RVD up for the Last Ride and nails it!! Undertaker covers RVD and picks up the win! RAW goes off the air..